I was born on June 19th, 1947 in Schwechat/Austria, where I spent most of my work-life and where I still live. I am married and have one son whose interest in minerals brought me into collecting myself. Since my retirement in 2007 I am now able to spend more time on my hobbies of colleting minerals and my love for orchids. My greatest love is for the ancient mining area of Lavrion in Greece. Every year I spend some weeks there, together with my wife Inge. Over the years I have made friends with many local collectors, as well as collectors from all over the world who share my enthusiasm for this wonderful area. Together we spend much time exploring the labyrinth of galleries, and also at the many beaches that yield ancient slag and their colourful minerals. Apart from Lavrion I am interested in slag-minerals from all over the world and in aesthetic micromounts from wherever they may come. Collecting minerals is not only a matter for the enthusiast, but I consider it also to be a social activity. Thus I have formed a circle of like-minds in my home town that meets regularly and we have initiated a yearly micromount-swapping-day. I am grateful to have also found mineral scientists that take interest in my collecting. This cooperation has lead to many interesting discoveries including new minerals. Especially my friend Uwe Kolitsch from the Museum of Natural History in Vienna has helped me with a number of identifications. Recently I have started to document my collection on photos, for which I use a WILD M420 microscope and a NIKON D70 camera. Recently I have bought myself a Nikon D200 and have started to use Zerene Stacker instead of Helicon Focus. 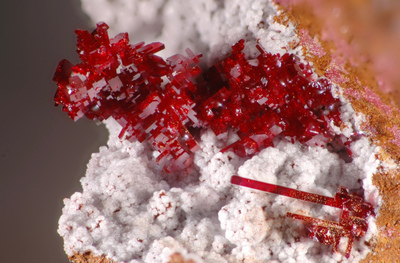 This page lists Fritz's favourite minerals, localities and photos. All lists in alphabetical order. 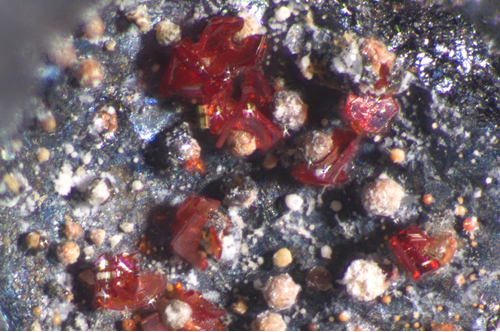 Red tabular crystals (SXRD-analysed by Uwe Kolitsch). Fritz Schreiber does not currently have any sponsored pages.